Owning a vehicle with blazing acceleration was a top priority for enthusiasts in the ’60s. Few gave much thought to stopping. Although brake options, such as front discs or drums with metallic linings, were often available, they were generally not at the top of the shopping list. Many drag racers were convinced that muscle cars equipped with disc brakes weighed more, making them slower. Unlike the bright orange Turbo Jet engines that were accented with chrome valve covers and large open element air cleaners, brakes did not have eye appeal. While they were functional, the disc brakes of the era featured plain cast iron calipers and rotors that were often already rusting when the vehicle was delivered new. The designers at GM, Ford and Chrysler all knew this and cleverly designed their wheels, including the optional rally and mag styles, so that they hid the brakes. Needless to say, most muscle cars were equipped with basic drum brakes. The brakes on the average and even many extreme muscle cars in the 1960s employed the same small four-wheel hydraulically actuated internal expanding drum brakes that had been the industry standard on nearly all vehicles built for several decades. They were marginal at best when these vehicles were new. Four decades later, they’re really not up to the task. Speeds on most roads and highways are now higher. People drive less defensively than they did back in the 1960s when the biggest distraction was an AM radio. Today, many drivers are talking on cell phones and text messaging while they are driving, instead of paying attention to the road. With those thoughts in mind, and in the spirit of survival in the asphalt jungle, it seemed appropriate to upgrade this Camaro to front disc brakes. With the inherent benefits of shorter stopping distances and resistance to fade, disc brakes offer superior performance to drum brakes, especially since the front brakes do most of the heavy lifting when it comes to stopping a vehicle, even one as light as a small block-powered first-gen Camaro. The disc brake kit we chose is from Stainless Steel Brakes Corp., better known as SSBC. They offer numerous drum-to-disc brake conversion kits, in addition to a comprehensive range of disc brake upgrade kits that go from mild to wild. These include a signature line of lightweight aluminum calipers that are available in single, two-, three-, four-, six- and eight-piston configurations. According to SSBC, they produce bolt-on disc brake kits for over 3,500 different vehicle applications and in excess of 5,000 unique applications. 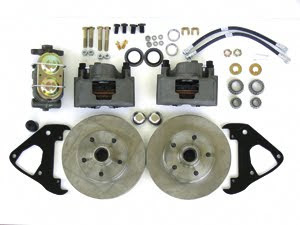 This particular drum-to-disc brake conversion kit is very affordable, easy to install, and includes every part needed, including a new master cylinder. The single piston calipers are complemented by ventilated rotors, and look very similar to the optional disc brakes on the 1969 Camaro. Likewise, the master cylinder is nearly identical to the one used by Chevrolet on first-gen Camaros that were equipped with disc brakes. Once installed, the SSBC disc brakes have a factory-like appearance and are designed to accommodate stock wheels as small as original equipment 14x6 Camaro Rally wheels. In preparation for the drum-to-disc conversion, we took a good look at the brake lines on the Camaro. After 44 years of service, they were in serious need of replacement. Because conventional brake fluid is hygroscopic, it absorbs moisture. In essence, the brake lines have been rusting from the inside out for over four decades, to say nothing of the aged and cracked rubber flex lines at the front and rear. One look at the rusty brake fluid in the master cylinder confirmed our fears. Since we were going to upgrade the front drums to disc and install a new master cylinder, it made perfect sense to replace all of the brake lines at the same time. Follow along with us as we upgrade the Camaro with disc brakes that will make it a more modern vehicle to drive, along with all new brake lines. The combination of both will make it a safer vehicle, and prepare it for many for years of trouble-free cruising. 1 Here’s the front brake drum after removing the wheel and tire assembly. Before getting to this point, chock the rear wheels, lift vehicle until the front tires clear the floor and install jackstands under the front subframe. 2 Removing the brake drum exposes internal expanding drum brake components. If the brake drum does not pull off easily, retract the shoes by inserting a narrow screwdriver through brake adjusting slot in backing plate and backing off the adjustment screw. 3 Removing the dust cap exposes the spindle nut and cotter pin. After straightening the cotter pin, pull it out with pliers. 4 Loosen the spindle nut that is threaded on the spindle. As you do, pull the retaining washer away with the nut, allowing the outer tapered roller bearing to become exposed for removal. 5 After removing the nut, retaining washer and outer wheel bearing, remove the hub by pulling it off of the spindle. After the hub is removed, clean the spindle to remove grease. 6 Remove the cover from the master cylinder. Using a syringe or turkey baster, remove as much brake fluid as possible from the master cylinder. Attach hoses to the front wheel cylinder bleeder screws and place the other end of the hoses in containers. Open the bleeder screws and drain all remaining brake fluid. Note the rust color of the brake fluid in the master cylinder, especially in the front bowl. 7 The flexible rubber brake line connects the wheel cylinder to the steel line. The junction is located at the front frame rail where the steel and rubber flexible brake lines are retained by a bracket and U-shaped spring clip. 8 Using quality tubing wrenches, unscrew the male fitting in the hard line from the female fitting in the rubber flexible brake line. 9 Using pliers, remove the spring clip from the frame mounted bracket. 10 Remove the brake shoes and springs and retaining hardware to expose the backing plate and wheel cylinder. 11 Here’s the top backing plate center bolt. Note that it has a retainer that is folded over the bolt shoulders to prevent it from loosening. 12 The folded portions of the retainer must be straightened to remove the bolt. Use a flat blade screwdriver to straighten the retainer and then remove the bolt. 13 Remove the remaining two nuts and bolts that hold the backing plate to the spindle. 14 Install the SSBC caliper brackets so that the caliper will be on the trailing side facing the firewall. Use the special upper spindle anchor bolt and the ½-20 bolts supplied to secure the brackets to the spindle. Torque the upper bolt to 90 to 100 lbs-ft and the lower bolts to 60 to 80 lbs-ft.
15 With the spindle clean, slide the spindle spacer provided in the kit onto the spindle with the beveled side facing inward. 16 After greasing the new inner wheel bearing and race with high-quality wheel bearing grease, install the wheel bearing and grease seal in the back of the rotor hub. Be sure to use the correct tool to install the grease seal and make sure that it seats properly. 17 Install the rotor onto the spindle and install outer wheel bearing after greasing the bearing and race. 18 Install the retaining washer and spindle nut next. Torque the spindle nut to 12 lbs-ft. While turning the rotor, loosen nut one flat and insert cotter pin. If the slot and pin holes do not line up, turn the nut back enough to insert cotter pin. Make sure that the rotor spins freely. 19 Install the cotter pin through slot and bend it. Using a rubber mallet, install the dust cover, being sure to tap on the corners, not the face of the cover when attaching. 20 With pads installed in the caliper, place one of the supplied spacers on each mounting bolt between the caliper and bracket. The pointer illustrates the correct placement of the spacer. Lube the bolts with silicone-based grease, slide the caliper over the rotor and tighten bolts to 40 lbs-ft.
21 With the caliper in place, install the new brake flex line. Secure the end of the flex line with a banjo bolt, using a copper crush washer on either side of the fitting and screw into back of caliper. Temporarily connect the flex line to the 12-point retaining bracket on the frame and secure with the U-shaped spring clip. Turn the steering assembly through a full left-to-right turn, noting that the flex line does not twist or double bend. If there is no problem, use the tubing wrenches to complete the connection. 22 This Camaro was factory-equipped with manual drum brakes and we are upgrading to manual front disc brakes. The SSBC kit includes a larger master cylinder that is a direct bolt-on replacement. Disconnect the two brake lines on the left side of the old master cylinder, using a six-point box wrench, followed by removing the two nuts from the studs that attach the master cylinder to the firewall. 23 The master cylinder and distribution block are removed from the firewall. The master cylinder attaches to the two upper studs. The stock pushrod is reused with the new master cylinder and no adjustment to the pushrod is required. 24 Here’s a comparison of original and replacement master cylinders. The replacement master cylinder from SSBC is larger, and looks much like the master cylinder Chevrolet used on first-gen Camaros with optional front disc brakes. The attachment points for mounting both master cylinders and the location for the brake lines is the same. 25 The original master cylinder was leaking from the rear seal, especially upon removal of the dust boot. It had a casting date of K116, which translates to November 11, 1966, identifying it as the original master cylinder that was installed on the Camaro when it was built by GM. 26 If you do not have a large bench vise, you can bleed the master cylinder bolted on the vehicle by using the brake pedal to push the piston in on the master cylinder. Position the bleeder hoses per instructions and fill the master cylinder to top using DOT 3 or DOT4 fluid. Use DOT5 if all fluid in the entire system will be changed. Once all of the bubbles have been eliminated, remove the bleeder hoses and install the master cylinder cover. Using a six-point wrench, remove the old brake lines that run from the distribution block to the master cylinder and install the new brake lines. 27 This comparison of the original brake lines and the new replacement lines illustrates the exactness of bends, spring wraps, and attention to detail. Be sure to note the placement of the retaining clips on the original brake lines. Carefully remove the clips and reinstall on the new brake lines in the same location. 28 We will install the new brake lines, starting with the steel lines that service the front brakes. The left front brake line starts at the front center port in the distribution block, extends over the steering box and turns left behind the upper control arm, where it meets the left front rubber flexible brake hose at the chassis bracket. 29 The line for the right front brake is long with numerous bends. It starts at the right front port on the distribution block and winds its way down alongside the steering box, behind the front crossmember, up the inside of the right front subframe and terminates at the mounting bracket where it meets the right front rubber flexible brake hose. 30 Routing of a new main brake line starts at the left rear port of the distribution block. When removing the old line, note the location and correct placement of the line in the mounting clips. The brake line is attached to the left side subframes and floor, ending at the mounting bracket that is bolted to the left rear passenger floor. At this point, the steel line screws into the female fitting on the rubber flexible brake hose. The flex hose runs to the junction block that is mounted on the differential. The flex hose screws into the larger of the female fittings on the junction block and is attached to the brackets at both ends by U-shaped spring clips. 31 The new rear brake lines are installed. The left and right steel lines run from the brass junction block to the wheel cylinders located at the top of the drum brake backing plates. Each line is secured to the differential housing by a clip welded to the axle tube. The junction block is held in place with a stamped steel bracket attached to a bolt on the differential cover. 32 With all of the brake lines installed, double check each of the fittings to be sure that they are tight and that the master cylinder is topped off with brake fluid. Open one bleeder valve at a time, starting at the wheel that is furthest from the master cylinder, working your way around to the wheel that is the closest to the master cylinder. At first, the fluid will escape with intermittent air bubbles. When all of the air bubbles stop, and a steady flow of fluid is observed for several seconds, close the bleeder valve and move on to the next wheel. If you need to pump the brake pedal again, close the bleeder before lifting your foot from the brake pedal. After bleeding all four wheels, and continuing to top off the master cylinder, push the brake pedal 20 to 30 times. If the pedal is hard, no further bleeding is required. If the pedal is spongy, repeat the bleeding process until a hard pedal is achieved. 33 A completed drum-to-disc brake conversion. One big plus over the original first-gen Camaro factory disc brakes is that SSBC uses a rust-resistant paint on the calipers and a protective coating on the rotors that will help keep them looking new. After bleeding the brakes, re-check all fittings and connections to be sure that there are no leaks. Check the master cylinder reservoirs to be sure that they are full. Reinstall the front wheels on the vehicle and turn by hand to be sure that the wheels spin freely and do not interfere with any brake components. Do not drive in traffic until the brakes stop the vehicle at a safe distance without a spongy pedal feel. Brake tests should always be done in an open area. SSBC suggests a 200-mile break-in period to enable the brake pads to “square up” to the face of the rotors for longer life and improved braking before using the brakes aggressively. Interesting set of tips. Brakes and suspensions go hand-in-hand when it comes to improving your car's handling and cornering capabilities. One could not co-exist without the other. I liked the complete article…. top notch written,thank you for all of the information you have got furnished. so that it will depart meaningful blog remarks one need to read, apprehend and examine the website about friv3 for free.